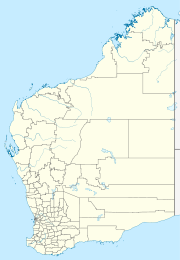 Carnarvon is a coastal town situated approximately 900 kilometres (560 mi) north of Perth, Western Australia. It lies at the mouth of the Gascoyne River on the Indian Ocean. The popular Shark Bay world heritage area lies to the south of the town and the Ningaloo Reef and the popular tourist town of Exmouth lie to the north. Within Carnarvon is the Mungullah Aboriginal Community. Inland, Carnarvon has strong links with the town of Gascoyne Junction and the Burringurrah Community. At the 2016 census, Carnarvon had a population of 4,426. The Inggarda people are the traditional owners of the region around Carnarvon. Before European settlement the place now called Carnarvon, located at the mouth of the Gascoyne River, was known as Kuwinywardu which means "neck of water". Australian-Aboriginals associating with the Carnarvon area typically associate as being Yamatji, traditionally speaking the Wajarri language. The town was founded in 1883, initially as a port and supply centre for the surrounding region, and is the administrative centre for the Shire of Carnarvon. The town site was officially gazetted on 4 June 1891, named after Henry Herbert, 4th Earl of Carnarvon, a past Secretary of State for the Colonies. Carnarvon has had three tramways. The first, shown on a Public Works Department map of 1884, ran from a landing site on the river, across Olivia Terrace to a shed on the other side of the road - A very short tramway indeed. The trolley used on this tramway was supposed to be hand powered, using a lever attached to crank on two of the wheels. However, there is a reference to the use of wind-power. The second tramway, constructed between 1886 and 1887, ran west from Olivia Terrace in a straight line to the jetty, which was halfway between Mangrove Point and Conspicuous Clump. It was horse drawn. The third, and partially remaining, tramway was completed on 9 November 1900. It runs from the townsite, across Babbage Island to the deep-sea jetty. It was constructed with a rail gauge of 2 feet (610 mm). It was 2 miles 5 chains (3.3 km) long. Due to the heavy loads of wool being carried on what was a very light railway, it was decided to convert the tramway to 3 feet 6 inches (1,070 mm) gauge in 1908–09. This tramway was worked with a steam locomotive. The tramway ceased operation in 1965. The Carnarvon Light Railway Association operated trains along restored tracks on the jetty; however, due to unsafe conditions the jetty is now closed to the public. agriculture, including cattle, goats, sheep and wool, and horticulture, the major industry of the area. A range of products are grown along the Gascoyne River, particularly bananas (mainly Cavendish bananas) and tomatoes, as well as grapefruit, mangoes and table grapes. Climatic advantages enable the growers to meet out of season demand both locally and in export markets. Radio Australia had a shortwave relay station (built during the 1970s) that used to relay programming to Europe, South Asia and Southeast Asia. There are five schools in the town; one Catholic, three Western Australia Department of Education schools and one independent. These schools are: St Mary's Star of the Sea Catholic School which was built in 1906, Carnarvon Senior High School, Carnarvon Community College (formerly Carnarvon Primary School and East Carnarvon Primary School), Carnarvon School of the Air and Carnarvon Christian School. Carnarvon has a warm semi-arid climate. Average yearly rainfall is 226 millimetres (8.90 in) with the rainiest months (and the most reliable rainfall) being between May and July as the northern edges of winter cold fronts brush the region. Occasional tropical cyclones affect Carnarvon during the summer months bringing heavy rain and strong winds. Apart from this erratic source of rainfall summers are normally dry. Temperatures range from an average maximum of 33 °C (91 °F) in February to 22 °C (72 °F) in July. Average minimums are 23 °C (73 °F) and 11 °C (52 °F) respectively. On 6 March 2007, Carnarvon equalled the record for Australia's hottest March temperature with a maximum of 47.8 °C (118.0 °F); this temperature had previously been recorded in the Western Australian town of Roebourne on 4 March 1998. From 1964 to 1965, 12 sounding rockets were launched from Carnarvon to a maximum altitude of 120 km. During the 1960s, NASA set up a tracking station nearby to support the Gemini and Apollo space programs. The tracking station was closed in the mid-1970s. Only the foundations of the historical site remain. The site is adjacent to the OTC Satellite Earth Station Carnarvon. On 20 May 1988, the bulk carrier Korean Star ran aground in bad weather near Cape Cuvier, within the port limits of Carnarvon. Around 600 tonnes of fuel oil were spilled into the ocean. Damage was limited to 10 km of remote beaches and coastline. The ship was not salvaged and left grounded, however very little of the wreck remains to be seen. ^ a b Australian Bureau of Statistics (27 June 2017). "Carnarvon (L) (Urban Centre/Locality)". 2016 Census QuickStats. Retrieved 5 January 2018. ^ "Carnarvon". Combined Universities Centre for Rural Health. Archived from the original on 20 February 2011. Retrieved 21 June 2012. ^ Bureau of Meteorology (21 March 2013). "Daily Extremes". Australian daily extremes tables. Commonwealth of Australia. Retrieved 29 April 2014. ^ "Carnarvon Airport". Climate statistics for Australian locations. Bureau of Meteorology. Retrieved 11 March 2017. ^ "Carnarvon Post Office". Climate statistics for Australian locations. Bureau of Meteorology. Retrieved 25 September 2015. ^ "The Keith Murdoch mystery: How a New Zealand rugby outcast lived out his secretive last years in WA". The Sunday Times. 14 July 2018. Retrieved 15 July 2018. Wikimedia Commons has media related to Carnarvon, Western Australia.